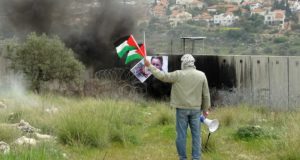 Ni’lin village has become the latest village to begin organising demonstrations against the building of the apartheid wall and the stealing of their farm land by the Israeli state. 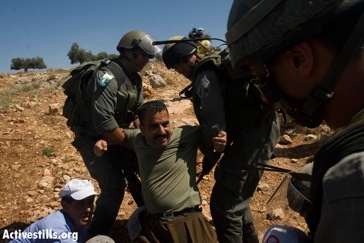 The village is located in the Ramallah district, approximately 10 kilometres from the village of Bil’in which has conducted a non-stop struggle against the confiscation of their land and the building of the apartheid wall on their land for the past three years. 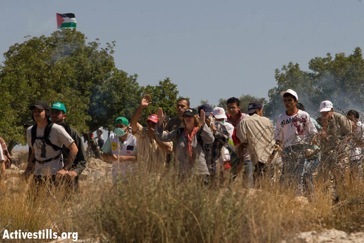 In 2003, other villages in the region, including Budrus, Al Midya, Deir Qadddis and Kharbata led the struggle in non-violent resistance against the wall, holding daily and/or weekly demonstrations. 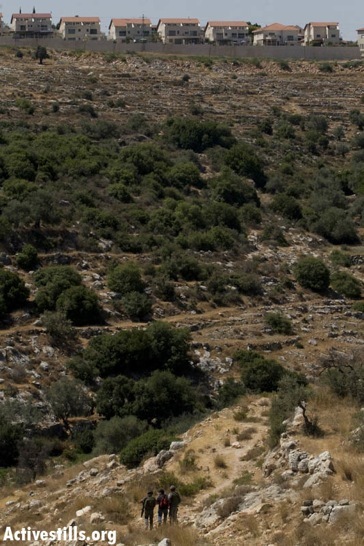 Budrus became one of the first villages to successful win an Israeli court order for the apartheid wall to be pushed back to the Green Line. 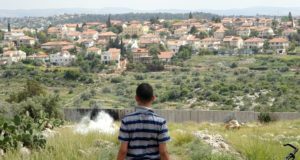 In the last week of May 2008, construction began once again on the land belonging to Ni’lin village in order to build the apartheid wall. Since construction began, the village has held large demonstrations nearly every second day. The village has been joined in their demonstrations by international solidarity activists and Israeli anti-occupation activists. In response to the demonstrations, the Israel military have reacted with extreme violence, including firing massive amounts of teargas from new weaponry mounted on jeeps. The weaponry consists of cannons which are capable of firing between 10 and 15 teargas canisters simultaneously. The biggest of the demonstrations, which happened last week, have involved around 500 people, the majority from the village of Ni’lin. On Friday night, the village held an innovative protest in which they assembled close to the fence line of the illegal Israeli settlement of Hashmon’im with pots and pans banging them to signal the poverty that Palestinians were suffering. They were also “armed” with other noise makers such as whistles and sirens to represent they would not be quite and accept the stealing of their land. 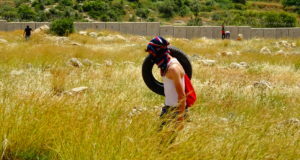 On June 8, approximately 120 Palestinian, Israeli and International demonstrators marched to Nil’in’s fields in an attempt to stop the destruction of their land. 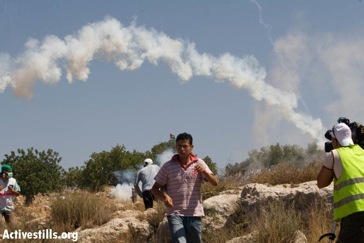 The non-violent demonstration was met with force by the Israeli military, who opened fire on the unarmed demonstrators. The front line of the demonstration, which was made up of Israeli anti-occupation activists, many from the Israeli Anarchists Against the Wall, were less then 10 metres from the soldiers. The Israeli soldiers, in violation of their own military regulations, fired directly into the front line An Israeli photo-journalist activist was hit by a teargas canister at close range, inflicting a deep wound near his hip. A number of times during the demonstration, canisters in large numbers fired at waist level, whizzed myself and other activists. A Palestinian activist and an Israeli anti-occupation from Anarchists Against the Wall were detained and arrested by the Israeli military. 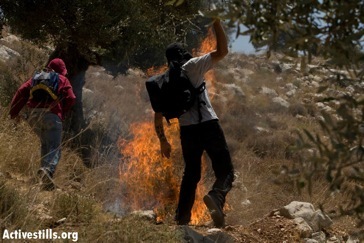 Ni’lin village has vowed to continue its demonstrations against the confiscation of their farm land and the building of the apartheid wall.